US demand for plastic film is expected to grow 1.5 percent per year through 2018 to 15.4 billion pounds, valued at $24.9 billion. Linear low density polyethylene (LLDPE) will remain the most common film resin and maintain solid growth, while polypropylene and other resins such as degradable types will outpace it from smaller bases. The food packaging market will exhibit the fastest gains. 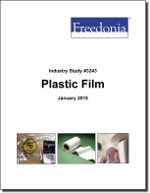 This study analyzes the 14.3 billion pound US plastic film industry. It present historical demand data (2003, 2008 and 2013) and forecasts (2018 and 2023) by resin (e.g., LLDPE, HDPE, LDP, polypropylene, PVC, PET) and market (e.g., food packaging, nonfood packaging, secondary packaging, nonpackaging). The study also considers market environment factors, details industry structure, evaluates company market share, and profiles 42 industry players, including Bemis, Sigma Plastics, and Sealed Air.